We’re fast approaching the end of the year and that makes planning even more important. Plan today so tomorrow you don’t panic! 1. First off, review your calendar and find out now what days your company will be closed and what the process will be with finance, shipping, etc., regarding the handling of orders in December. Too many sales are lost at the last minute due to an order not getting processed. Determine what days you might be taking off and make a note of all personal obligations you will have in November and December. The more you know in advance how your time will be challenged, the better you can plan around it. 3. Call all of your existing customers NOW and explore with each one where they are with their budgets. It’s always amazing the number of companies that have money to spend at the end of the year. These are the customers you have the best relationships with, so it makes sense you’ll be able to have open discussions with them. 4. Speak with your credit department to see how you might be able to speed up the processing of credit applications for new customers. Nothing will hurt you more than having a new customer at the end of the year who wants to buy, but you’re unable to take the order due to a delay with a credit application. 5. Schedule as many sales calls as possible between now and Nov. 15. After November 15, it can become harder to get appointments, so the more you have now, the better off you will be the closer we get to the holidays. 6. With each customer conversation, you have be sure to bring up the coming holidays as a way of gaining a sense of urgency to get orders now versus in the crunch of the holidays. 7. Starting Nov. 15, call customers and thank them for their business this past year. Yes, you must be serious. If you don’t mean it, don’t do it. I’ve found reaching out to customers and thanking them for their business is a great way to learn about their plans for the coming year and any year-end needs they might have. 8. Do not allow your customers to think you might be having a year-end sale the last couple weeks of the year. Many vendors fall victim to this mistake, all in an attempt to make their annual number. Customers are smart. They know games vendors play, and if they smell a deal coming, they will wait. Discounting at the end of the year is a bad disease created by investors. Don’t fall victim to it! 9. 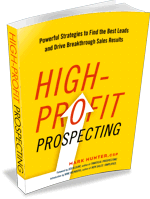 Accelerate the number of prospecting phone calls you make. This might sound contrary, but this time of year it is very effective. There are prospects out there who have money to spend and year-end decisions to make. Your phone call can very well be the phone call that compels them to decide. The reason I’m a strong advocate of 4th quarter prospecting is because many salespeople don’t believe it works, leaving more opportunities for you! I watch too many salespeople panic about missing a number, and with the panic comes fear and ultimately poor thinking. The biggest mistake you can make is to think the worst is going to happen. If you deal with professional buyers, this is the time of year they make easy money. It’s hard to hide panic and concern, and a sharp buyer will seize the moment to get a better deal from you. PrevPreviousWhat’s Your End Game for Social Media? As usual Mark great tips and advise, always appreciated. Keep up the great work. – Barry.